A very fine read indeed. My third copy of this book, bought solely for the purpose of bookcrossing, because I liked it too much to let it wither on that shelf in the second-hand store. "From an isolated mountain cabin, Deanne Wolfe, a reclusive wildlife biologist, watches a den of coyotes that have recently migrated into the region. She is caught off-guard by a young hunter who invades her most private space and confounds her self-assured solitary life." If ever anything has sounded like a cheeky 13-penny love story booklet, this has. But read on. There's more to that story, and to this book. "On a farm several miles down the mountain, Lusa Maluf Landowski finds herself unexpectedly marooned in a strange place where she must declare or lose her attachment to the land that has become her own. A few miles down the road, a pair of elderly, feuding neighbours tend their respective farms and wrangle about God, pesticides, and the possibilities of a future neither of them expected. Over the course of one humid summer, these characters find their connections to one another and to the flora and fauna with whom they share a place. Well. 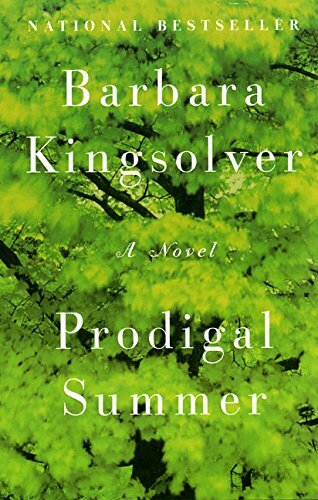 Anyway, I just love this book and the way Barbara Kingsolver conveys her deep love of land, life and community through these intertwined stories. And they are outrageously funny, too. Garnett and the turtle, my oh my. I am starting a ring with this book. Sending it through the mail can be expensive, it is a hefty volume. It will therefore be a slow hand-over-ring.